MINISTERS, GOVERNMENT OFFICIALS and politicians from various parties are due to attend a ceremony to commemorate British soldiers who died during the Easter Rising today – but Sinn Féin has declined an invitation. The State’s official 1916 centenary website says today’s event at Grangegorman Military Cemetery in Dublin is being held “in honour of the British soldiers who met their demise during the rebellion”. Many of these men, called in from abroad once news of the uprising reached England, would never return home. A total of 485 people lost their lives during the Easter Rising. According to official research conducted by Glasnevin Cemetery, the majority of these fatalities were civilians, while over 100 British forces and more than 50 rebels were also killed. Sinn Féin contends that “as Irish republicans it would not be appropriate to attend a tribute to British soldiers who shot and killed Republicans in 1916″. The party’s chief whip, Aengus Ó Snódaigh told An Phoblacht his party had sought to “celebrate and commemorate the bravery of those who fought the British Empire”. Those who wish to remember the enemy of Irish republicanism in that conflict – the British soldiers who died fighting against Irish patriots – should be free to do so if they wish, that is of course their right, as much as it is our right not to take part in such commemorative events. The party’s stance has been criticised by Fianna Fáil, however. TD Darragh O’Brien will attend the event on behalf of Micheál Martin’s party. 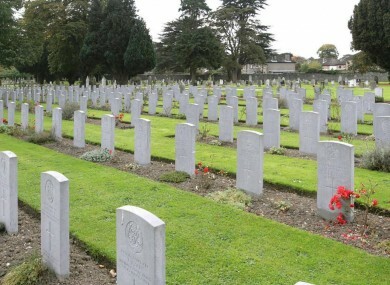 The Dublin deputy, whose two grand uncles fought on the Irish side, said it was appropriate to commemorate all who died. “If the British Queen can go to the Garden of Remembrance and bow her head to those who died in 1916, then I don’t think it’s inappropriate to attend an event to commemorate the British who died. It could very well be the case that both of my relatives were involved in direct action against the men being commemorated. Queen Elizabeth II won widespread praise following her 2011 State visit – during which she laid a wreath in honour of those who had died in pursuit of Irish freedom, and gave a landmark speech about wishing things had been “done differently, or not at all”. Sinn Féin’s Martin McGuinness later told RTÉ radio he had been “tremendously impressed” by the way she had commemorated Irish republicans. Today’s invitation-only ceremony at Grangegorman will include readings of historical accounts, music and prayer. A solemn wreath-laying will take place, followed by a minute of silent reflection and a piper’s lament. The national flag will then be raised to full mast. Email “'Not appropriate': Sinn Féin rejects invitation to commemorate British 1916 deaths ”. Feedback on “'Not appropriate': Sinn Féin rejects invitation to commemorate British 1916 deaths ”.